YAOUNDE, Jun 28 2012 (IPS) - As Lysette Mendum listens to the sound of bulldozers crashing through the forest clearing a road to a mining site near her small village of Assoumdele in the Ngoyla-Mintom forest block in Cameroon’s East Region, she has never been more fearful in her life. The forest block is 943,000 hectares of relatively intact forest that straddles part of eastern and southern Cameroon. And it is Mendum’s home. But all the indigenous Baka widow thinks about when she hears the bulldozers is how uncertain the future is for her three kids. The indigenous Baka, historically called pygmies, are an ethnic group of about 35,000 people who have traditionally lived within the forests of southeastern Cameroon. But now they have been displaced from their traditional homes in the government’s bid to develop this West African nation into an emerging economy. “The government of Cameroon and some white people moved us out of the heart of the Ngoyla-Mintom forest block and resettled us in this village in the precinct of it. Now we go into the depths of the forest in the day and return in the evening. We are not allowed in there at night,” Mendum told IPS. As logging and mining companies are granted concessions to large portions of the country’s forests, environmental agencies have expressed concern about the situation. Of Cameroon’s 22.5 million hectares of forest area, 17.5 million or roughly 78 percent are classified as productive forests and are being allocated to logging companies, according to statistics from the Ministry of Forestry and Wildlife (MINFOF). Out of the 17.5 million hectares of productive forests, the government has already granted logging concessions for 7.5 million hectares. In the Ngoyla sub-district where Mendum lives, an Australian iron ore exploration and development company has been granted mining rights. A source at the MINFOF told IPS that a modest 20 percent of the 17.5 million hectares of productive forests has been classified as wildlife reserves, which include national parks, game reserves, botanical and zoological gardens, sanctuaries and hunting zones. “Government has been dishing out logging and mining permits since the early 2000s to various companies in an effort to generate wealth and become an emergent economy by 2035. But this has had the effect of depriving the Baka Pygmies of access to the forests they have always considered their natural home,” David John Hoyle, director of conservation at the World Wide Fund for Nature (WWF), told IPS. This is because the 1994 Wildlife, Forestry and Fishery law prohibits human settlement inside protected areas, which include areas marked for logging and national parks. The law also restricts access to these areas. So from 2000, the government began moving the Baka out of the productive forests and attempted to integrate them into society. Mfou’ou Mfou’ou, the director of conservation at the MINFOF, told IPS that the government was working with its partners to ensure that the forests are managed in a sustainable manner. “This means also protecting the rights of the Baka,” he said. He said his ministry signed a 1.7-million-dollar accord with the Ministry of Social Affairs to enable it to implement best practices in the socio-cultural and economic integration of the Baka into mainstream society. But it has been against their will. 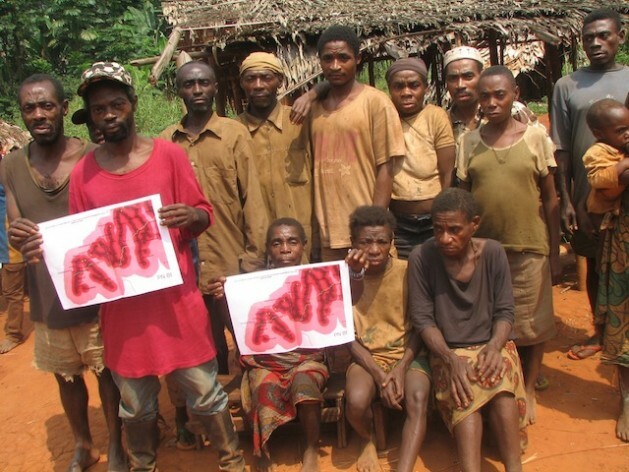 “The Baka have been living in the forests of southern Cameroon for thousands of years, and they have lived in total harmony with the forest,” Hoyle said. For the Baka, it has been a devastating exclusion from their traditional land and its resources. “At first we thought our people would benefit from all these companies coming here, but all we got at the end was an interdict asking us not to go into some parts of the forest near the Boumba Bek National Park,” said Ernest Adjima, president of Sanguia Bo Buma Dkode, a Baka association, which translated from the original Bakola means “One Heart”. Samuel Naah Ndobe, coordinator of the Cameroonian Centre for the Environment and Development, told IPS that the government now wants to settle the Baka on agricultural land along the country’s main roads. But now when they return to the forests they are treated like unwelcome visitors. “We can’t help being afraid because everyday strangers come to us preaching a new gospel of mining. And as the days go by, we see systematic restrictions on our rights,” Mendum told IPS. Naah Ndobe said that when the Baka attempt to access the forests, game rangers and conservators routinely evict them. “With no land to call their own, these first settlers are now very vulnerable. They no longer have rights to the land which they have enjoyed and considered home for centuries,” he told IPS. Government’s user rights policy for the forests has also sidelined the Baka. The policy allows the Baka the right to retrieve non-timber products from the forests like medicinal herbs, wild fruits, tubers, honey, and game for personal consumption. But the Baka have not been allowed to sell any of the items they collect from the forest. “The Baka can only hunt game for family consumption, for instance. So they cannot sell the game to send their children to school,” Naah Ndobe said. Now, there is a deep sense of defiance among the Baka and an urgency to share in the resources of their traditional land. “If they come for us we shall not run away, we shall wait for them to come and kill us here because we rely on this forest for our basic needs,” Mendum told IPS. But they are not struggling alone. In 2000, the WWF began its Jengi Southeast Forest Programme, which aims to negotiate access rights for the Baka into protected forest areas, among other things. Hoyle said progress has been made, with some logging companies committing to protect the forests. “WWF has been assisting logging companies that have embraced Forest Stewardship Council (FSC) certification standards and, along with the Baka, mapped out areas of social, economic and cultural interest to the Baka within logging concessions with guarantees that they can harvest wild tubers, honey and medicinal plants and carry out fishing in such areas,” Hoyle told IPS. The FSC is a non-governmental organisation established to promote the responsible management of the world’s forests. He also said a memorandum of understanding has been reached with the government to guarantee the Baka access to the Boumba Bek National Park. It not only enables the Baka to gather food, it also allows them to perform their traditional Jengi rites, which usually take place at night. Jengi is the Baka god or spirit of the forest. Mfou’ou said that while efforts are being made to guarantee the Baka access rights to national parks, social infrastructure like schools and health centres are also being constructed. However, Naah Ndobe said it was urgent that Cameroon develop more specific support structures and policies to cater for the rights of the Baka.